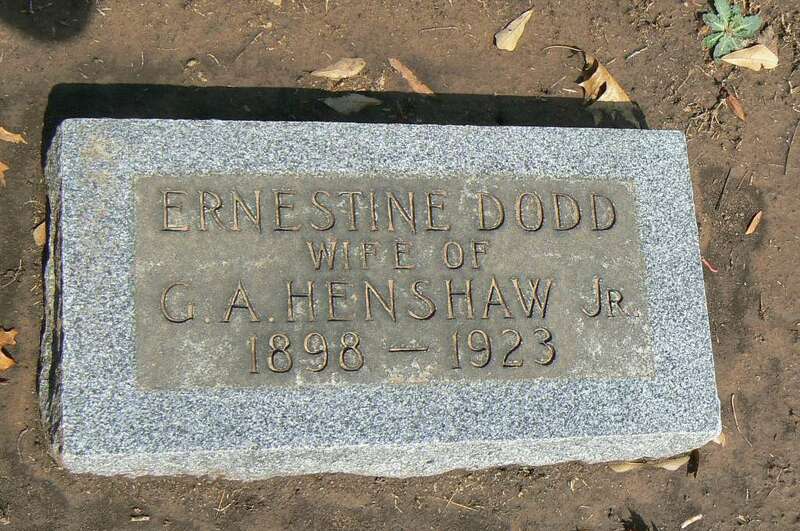 He married Ernestine Dodd.12 Ernestine was born 189812 [about 190013]. 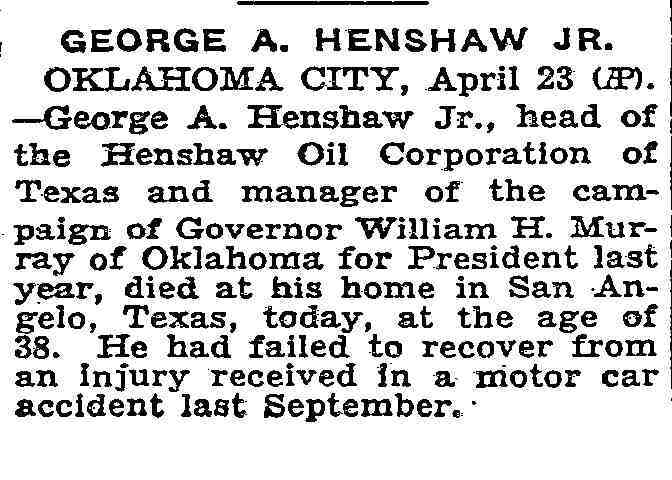 Henshaw, George A. Jr., head-of-household, age 24, born in Illinois; parents born in United States; rented home; occupation: [..unclear..] manager, oil co.
Henshaw, Ernestine, wife, age 20, born in Alabama; father born in Ohio; mother born in Missouri. George A Henshaw Jr., formerly of Oklahoma City who has lately sold his vast west Texas oil holdings for $3,000,000, chartered an airplane and jazz band at San Francisco and flew to Reno with Miss Caledonia Clay PULLIAN to be married. WHEELING, W. Va., Jan. 16. -- An aerial honeymoon has its advantages, but for George A. Henshaw and the former Miss Caledonia C. Pullman, a better means of transportation in cold weather is a vehicle with the same name as the bride's. After flying from Los Angeles they took a train for New York. 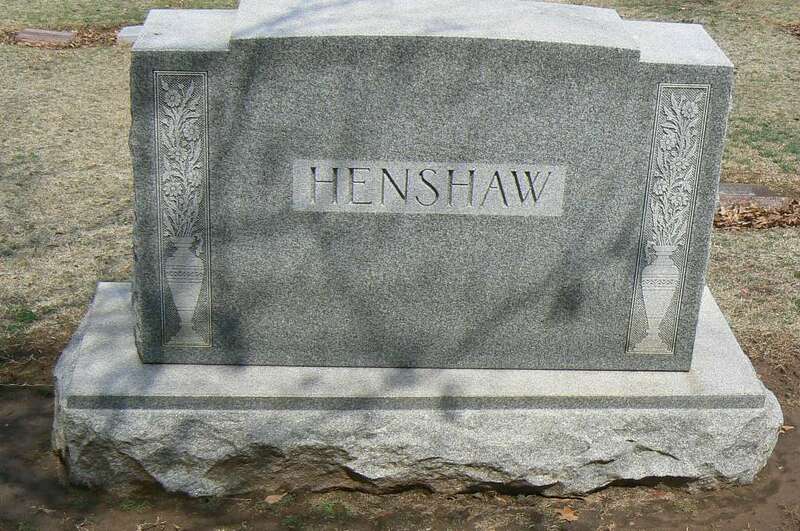 Henshaw, George Sr, head-of-household, age 55, born in Illinois; father born in North Carolina; mother born in Alabama; first married at age 39; owned home ($40,000 value); radio in home; occupation: manager, insurance. Henshaw, Lillie, wife, age 45, born in Kentucky; father born in Illinois; mother born in Kentucky; first married at age 30. 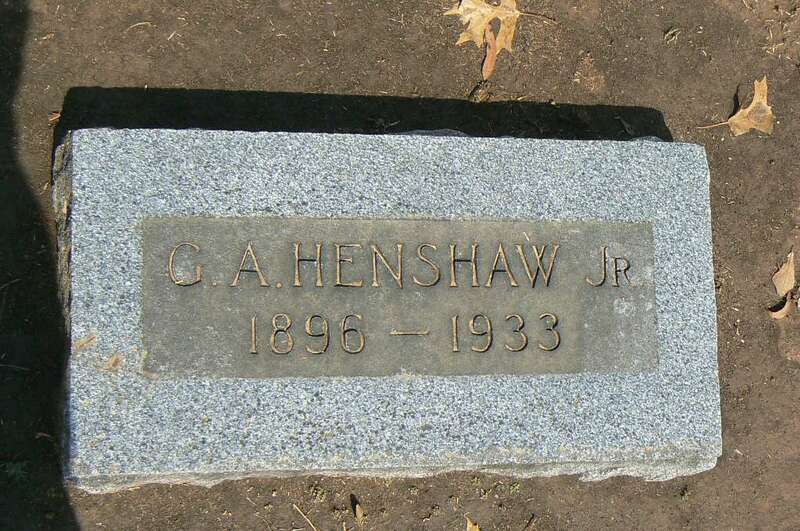 Henshaw, George Jr, son, age 34, born in Illinois; father born in Illinois; mother born in Kentucky; first married at age 32; occupation: [..unclear..], oil. Henshaw, Donia, daughter-in-law, age 23, born in Mississippi; father born in Tennessee; mother born in Mississippi; first married at age 21. Henshaw, Ellinor, g daughter, age 11 months, born in Oklahoma; father born in Illinois; mother born in Mississippi. Lalluren [unclear], Lucy, roomer [unclear], age 26, born in Oklahoma; father born in Oklahoma; mother born in Wisconsin; single; occupation: nurse, hospital. Chiyaki [unclear], Marchyo, servant, male age 49, born in Japan; parents born in Japan; divorced; occupation: cook, private family. Aor [unclear], Tazo S., servant, male age 46, born in Japan; parents born in Japan; single; occupation: cook, private family. 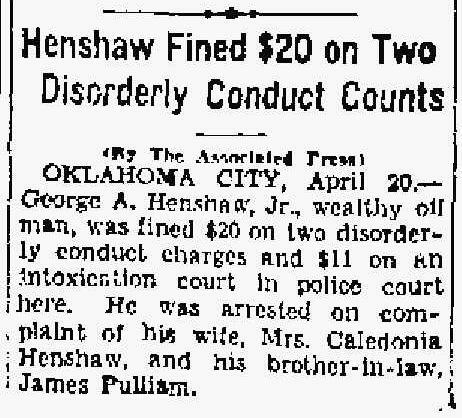 Henshaw, George, head-of-household, age 35, born in Oklahoma; parents born in Oklahoma; first married at age 34; owned home ($15,000 value); no radio in home; occupation: broker, oil; World War I veteran. Henshaw, Caledonia, wife, age 23, born in Mississippi; parents born in Mississippi; first married at age 22. Henshaw, Caledonia Elenor, daughter, age 4 months, born in Oklahoma; father born in Oklahoma; mother born in Mississippi. Henshaw, Mrs. Caledonia P., 624 Urbano Dr., Housewife; Republican. Allen Wheatley cemetery database: http://teafor2.com. 1930 census, Ward 3, Oklahoma City, Oklahoma County, Oklahoma; roll T626-1919, ED 85, page 3A, line #22, dwelling #34, family #67. 1930 census, San Angelo, Tom Green County, Texas; roll T626-2400, ED 8, page 12A, line #1, dwelling #267, family #290. Obituary of George Allen Henshaw, Jr.. Contribution from Marilyn King (). 1900 census, Carterville, Williamson County, Illinois; roll T623-354, ED 109, page 11B, line #81, dwelling #223, family #230. 1910 census, 3rd Ward, Guthrie, Logan County, Oklahoma; roll T624-1260, ED 126, page 7A, line #2, dwelling #113, family #113. 1920 census, Amarillo, Potter County, Texas; roll T625-1837, ED 202, page 23A, line #4, dwelling #259, family #539. Ancestry Family Tree data posted by "Jazzinbob1". Contribution from Lucy Manson (). by The Oklahoma Publishing company; reproduced on: http://www.rootsweb.com/~okbits/almanac.html. 1910 census, Darracott Precinct, Monroe County, Mississippi; roll T624-752, ED 68, page 11B, line #78, dwelling #162, family #162. "The Bee", Jan 16 1929; http://www.ancestry.com. Obituary of George A. Henshaw, Jr.; "The New York Times", Apr 24 1933; Historical Newspapers, Birth, Marriage, & Death Announcements, 1851-2003, http://www.ancestry.com. Obituary of George A. Henshaw, Jr.; "The Big Spring Daily Herald", May 7 1933; http://www.ancestry.com. California Voter Registrations, 1900-1968; http://www.ancestry.com. 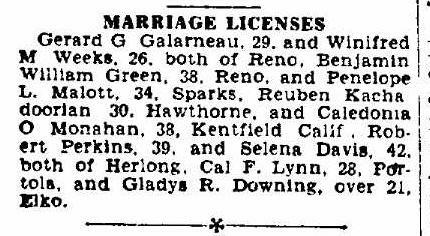 Marriage of Caledonia Clay (Pulliam) Henshaw; "The New York Times", Mar 8 1935; Historical Newspapers, Birth, Marriage, & Death Announcements, 1851-2003, http://www.ancestry.com. 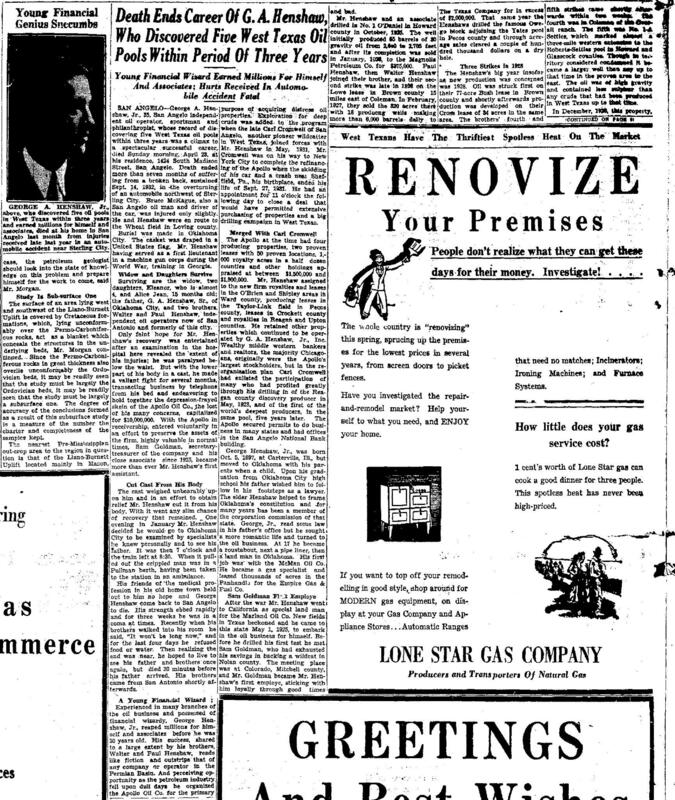 "The Abilene Morning News", Thursday, Apr 21 1932; http://www.ancestry.com. "Nevada State Journal", Dec 30 1951; http://www.ancestry.com.